It comes after years of wrangling between firms keen to avoid more red tape and environmentalists seeking to cut the use of hazardous pollutants. EU nations will have until 2018 to implement the new rules. Reach has been described as the most important piece of EU legislation for 20 years. It puts the onus on business rather than public authorities to test chemicals for safety - including the thousands of chemicals that have been used for years without proper understanding of their effect on health or the environment. 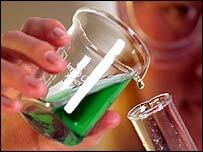 It is also meant to encourage the replacement of hazardous chemicals with safer ones, and to spur innovation. However, environmentalists had always hoped the law would go further than it did in its final version - and industry groups still say it went too far. "This deal is an early Christmas present for the chemicals industry, rewarding it for its intense and underhand lobbying campaign," said Green MEP Caroline Lucas. Environment Commissioner Stavros Dimas said it would "increase our knowledge about chemicals, enhance safety, and spur innovation, while encouraging substitution of highly dangerous chemicals by safer ones". Europe's main consumer group BEUC said the adoption of the law was not the end of the story. "What has been agreed must now be implemented properly and we will actively monitor the situation," warned BEUC director Jim Murray. He pointed out that the deal still allows some cancer-causing substances and other poisonous chemicals to be used in consumer products, even when safer substances exist, as long as they have been subject to "adequate" control. "The only adequate form of control for such substances is substitution when possible," he said. The system for registration, evaluation and authorisation of chemicals (Reach) demands that firms provide lists of the chemicals they use and specify any possible risks. A newly-established agency in Finland will oversee the way the firms assess chemicals for safety. The register will initially focus on the most toxic chemicals and those produced in the largest quantity. Manufacturers will have to come up with plans to replace the most hazardous chemicals, but they will not be banned outright as environmentalists had hoped. While the EU said the deal improved the safety standard of chemicals, green lobbyists were angered by what they saw as the EU bowing to industry pressure. Conservation body the WWF said the final text of Reach "was not the complete disaster that it would have been if the chemical industry lobby had succeeded in all their wrecking tactics" but said it left a number of substantial problems unsolved. It also warned that the deal would continue to allow potentially harmful chemicals into the environment. After the legislation was passed the UK's Federation of Small Businesses (FSB) called on its government to help small firms. "This regulation will affect small businesses that manufacture or import chemicals in the EU as well as those using chemical preparations in their industrial or commercial activities," it said. It said that the cost of complying with the new rules would hit small firms "especially hard" because they were "least able to absorb costs or pass them on to their customers, unlike larger businesses". John Holbrow of the FSB added: "Civil servants must bear in mind the thousands of jobs across the business spectrum that depend on Reach being implemented well. "With the right advice small firms can do their bit without being left exposed to prosecution due to their understandable lack of resources and specialised knowledge." And the CBI warned: "An overly bureaucratic implementation of the regulations could yet undo the benefits of today's sensible compromise and make REACH unworkable."